Metronidazole for dogs and cats is an antimicrobial antibiotic used for the effective treatment of many different diseases and conditions in dogs, cats, and horses. This medication is geared toward animals who are suffering from dangerous infections such as tetanus and liver disease, as well as from causes of inflammatory bowel diseases like Giardia, Entamoeba, Balantidium, and Trichomonas. It also fights oral infections like periodontal disease. Metronidazole for dogs and cats can even be applied externally to fight skin conditions such as acne (particularly in cats). 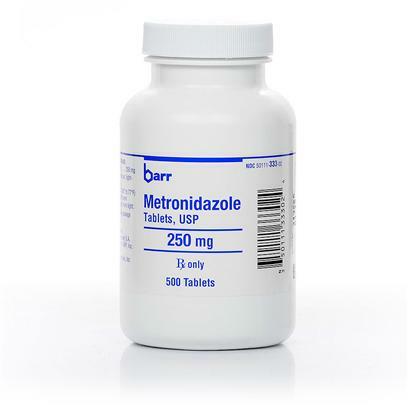 Metronidazole for dogs and cats may also be used with other types of antibiotics (e.g., penicillin, some cephalosporins, and amino-glycosides) to fight off various anaerobic bacteria and protozoal infections, as well as colitis brought on by the prior use of other antibiotic medications. Metronidazole for dogs and cats is the Generic Alternative to Flagyl. As with many antibiotics for cats, dogs, and horses, some side effects may occur. When using Metronidazole for dogs and cats, watch for neurologastro-intestinal disorder, lethargy, weakness, neutropenias, hepatoxicity, hematuria, anorexia, nausea, vomiting, and diarrhea. Though not common, serious side effects may occur, such as low white blood cell count, liver failure, and blood in the urine, or dark urine. Long-term use or overdose may cause neurologic symptoms as well. Metronidazole has also been known to cause birth defects, and should not be used by pregnant mothers. Some medications and antibiotics will interact with Metronidazole for dogs and cats. Do not combine with any of the following medications: Cimetidine (Tagamet), Phenytoin (Dilantin), Phenobarbital, or Warfarin (Coumadin). Other drugs may also affect Metronidazole for dogs and cats, so be sure to consult your veterinarian before starting this medication. Use Metronidazole for dogs and cats as directed by a veterinarian. Dosage and length of use vary according to the need for treatment and size of animal. Metronidazole for dogs and cats is best served with food as this medication contains a strong, bitter taste.